Fixing quick meals on hiking or camping trips is easy if you have all the right ingredients. 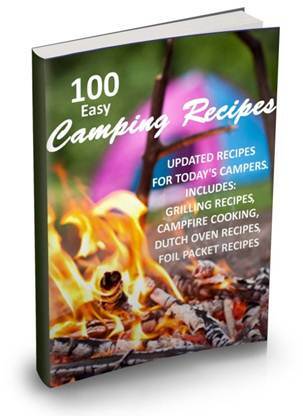 So browse through these recipes and get a head start by combining seasonings and anything else you can at home to make your campfire cooking a breeze. 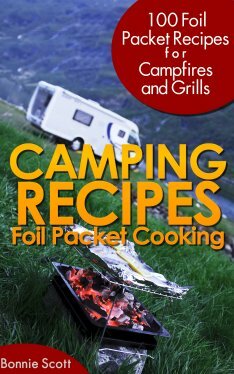 Beef camping recipes include dutch oven recipes, foil wrapped meals or grilled meals. 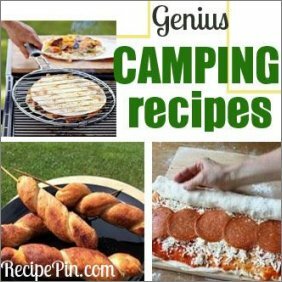 Beef recipes for camping. Got one you would like to share? Just email it to us and we will add it. 1 pkg. frozen green beans, 9 oz. Place flour, salt and pepper inside a Dutch oven and blend together. Coat meat in flour mixture, then remove and add shortening to pot and let heat, stirring occasionally. Place meat back into Dutch oven and let cook in flour and shortening mixture for a few minutes, stirring frequently. Pour off any access fat. Add water, thyme and bay leaf. Cover and let cook for two hours. Stir in prepared vegetables. Cook until meat and vegetables are done. Use additional flour to thicken liquid into gravy. Combine all the above except for steak. Place steak into a Ziploc freezer bag and add mixture. Let steak marinade for at least four hours, refrigerated. Place sirloin steak onto a campfire or barbecue grill and cook as desired. Serve with baked potato or other favorites. Lightly grease a large square piece of heavy-duty foil. Form the ground chuck into a single patty, place onto the center of the foil square. Place prepared vegetables around the beef patty. Top with butter and salt and pepper to taste. Wrap foil around beef patty and veggies. Place on a preheated grill, turning often. Cook for 30 minutes or until done. Spray foil with non-stick cooking spray. Place bell pepper and onions on foil; sprinkle generously with salt and pepper. Put the steak strips on top of onions and peppers. Sprinkle Cheddar cheese on top. Wrap the foil around steak and veggies and seal tightly, leave some room for air to flow. Cook on a grill or on top of hot coals for approximately 15 to 20 minutes. Turn packet over half-way through cooking time. When cooked, carefully open foil and slide steak, veggies and cheese onto Hoagie roll. Salt and pepper Cut bacon into bite-sized pieces. Brown bacon and stew meat in a 12 inch Dutch oven. Cover meat with water and simmer covered for 2 hours or until stew meat is tender. Add water when needed. Add rice, mushrooms, salt and pepper. Cook covered another 30 minutes. Stir in sour cream and serve over rice. Brown the cubed sirloin in a skillet over high heat for 30 seconds on each side. 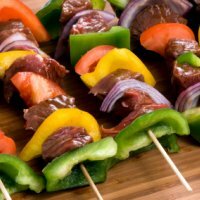 Secure beef and veggies onto skewer, alternating the ingredients. Cook over an open fire for 15 to 20 minutes until done. Sprinkle with breadcrumbs and grated cheese before serving. Cook potatoes inside a covered/vented bowl in the microwave until just tender (4 to 7 minutes). Cut the steak into 1 1/4 inch cubed sized pieces. Place steak and prepared veggies into a bowl and drizzle lightly with dressing. Toss to coat evenly. Thread veggies and beef onto eight 9-inch skewers. Place the kabobs on a grid over medium-hot coals. Grill uncovered for approximately 10 to 12 minutes for medium-rare to medium-well done steak. Turn kabobs occasionally. Sprinkle with salt and pepper. Drizzle with 2 tablespoons of Caesar dressing, and then serve.